With the Rattie Sisters living more peacefully together, I have more time that I can spend doing other things. One of those has been knitting on the Rusty Entrelac Bag. I’m now into the 8th round of squares. I started using black a couple of rounds ago. Imagine a black iron pot getting rusty from the top down. At this point, I’ll be using black through the rest of the bottom of the bag. Then I’ll probably use one of the reds for the handles, maybe with some yellow here and there for an accent. Mind you, the Rattie Sisters are still getting adequate time out of the cage, and all the attention they ask for. Something is changed, though. Lola, last night, sat under a blanket on my lap for 15 to 20 minutes. Not running around like there’s too much to see and do and she has to try to see and do it all in the next 15 seconds or she’s going to just die. Just sat quietly under there, enjoying my lap as a different, warm nesting spot. My personal theory? Sable has gotten strong enough now, emotionally, to give Lola the attitude adjustment she needed to divert herself from her bullying ways. Fingers crossed, anyhow. We’ll see how things proceed in the days to come, but so far, so good. Another thing I’ve been spending time on is Second Life. In a recent and interesting turn of events, I’m becoming a 2-d artist. That means I’m creating posters, paintings, and photographs to sell, for people to hang on their walls. I’m currently setting up a small shop in the marketplace on Ex Nihilo, the sim where I rent my home parcels. And I have some photographs in an art show up in Yule, too. I’m afraid I don’t have landmarks handy for either of those locations, but you can use the map in-world to search for either sim, and the places in question aren’t hard to find once you get there. I won’t be sharing the images I’ve turned into art here, but once the shop looks presentable, I’ll post a picture of it. Imagine – me, running an art gallery! Way cool! So my evening, at least during the official town trick-or-treat hours from 6 to 8, will be spent with most of the lights in the house off, curled up on the bed and watching some good tv. And eating a few treats myself. Which works quite well for me. I hope you’re having a good Halloween, whatever that may mean for you! I almost hate to say anything about it. History has proven that anytime I think I know what’s going on with the Rattie Sisters, I wind up being wrong a week or two later. Most recently, I had pronounced sadly that Sable and Lola weren’t going to be able to live together. Lola was getting too aggressively violent with her dominance behavior, and Sable was having night terrors. Separate cages seemed to be the permanent fate for these two. Then, this weekend, less than a week after Lola had her opportunity to escape due to human error, Sable engineered her own escape. Without any help from humans. Gryphon had been taking Sable’s cage in on his bed overnight, to keep her company. Sable’s cage is the same one that she and Star lived in ever since they came home to us, a homemade contraption of hardware cloth. For a year and eight months, it’s been more than adequately secure. Until Sable got so desperate the other night, overnight in Gryphon’s room, that she managed to push the corners of the latched door out far enough to squeeze through. Gryphon awoke to an empty cage. We surmised she probably hadn’t gone far, so Gryphon began searching through the stacks of stored items in his room. There were signs of Rattie habitation scattered here and there – a pocket of space holding a chewed hazelnut and some pellets; a speaker wire gnawed in two. Finally, he saw some movement in a large bag of packing peanuts he kept behind the end of the bed. There she was, happily nesting. So, Sable turned up safely from her big adventure, just as Lola had from her own the week before. And we were presented with a problem. Our cage collection includes two smaller ones, and one large. The smaller ones are Sable’s homemade cage, which is only just big enough for two rats, and Lola’s commercially made one, which is just a bit too small for a pair of Ratties. We could no longer trust the security of Sable’s cage without rebuilding the door. Sable knew now that she could escape, and would certainly do it again, and if Sable could, then Lola would, too. Which left us with only two cage options to house the two rats – Lola’s secure cage, which would house one, and the large cage, which would house at least three or four. I felt I was left with no option but to try putting Sable and Lola together again. To test the theory, I put them both in Lola’s cage for the day – it’s too small as a permanent residence for two, but fine for temporary. They actually got along. In fact, they spent most of the day curled up together. Encouraged, we decided to set up the large cage. Both Ratties have been living together in it since Saturday night. I’ve been watching carefully for signs of bullying. As time passes, Lola is gettting a bit more bold again. But it was very good to see on Sunday that at least half the times I heard squeaking from the cage, it was Sable who was on top of Lola, pouncing and fighting back against the younger bully. Could be that she’s finally pulling out of the depression over losing her sister enough to assert her rights. That, and I’ll bet she’s even more desperate for the company, and more willing to do what’s needed to make it work. And maybe, just maybe, as Lola reaches full maturity, she’s mellowing out a little bit. As well as being desperate for company herself. So, once again, we’re treated to scenes like this, Lola and Sable sleeping in a single pile together. Lola isn’t over her bratty ways yet. She’s still being Little Miss Grabby when it comes to treats, running quickly to stash her own, then dashing back to Sable to take hers. I’ve noticed, though, that Lola winds up forgetting about the one she stashed, and sometimes even the one she stole, and Sable eventually winds up with the goodies she wants anyhow. I’m not going to make any rash declarations about this being the permanent state of reality for the Ratties. I’ve done that before, and obviously, I’ve been wrong every time. For now, then, we’re just going to enjoy the current State of Relative Peace that we’ve attained. …Judith! Congratulations, Judith, the bag is yours to take care of. And I know you’ll take good care of her. I also know where you live, so we’ll be making arrangements soon for you to collect your bag. Many thanks to everyone who expressed a heartfelt desire to give a good home to My First Entrelac Bag. My readers are clearly kind, loving people, who know that good handknits deserve care and attention. If you didn’t win this week, fear not – there will be another Freebie Friday in just a few days! Entries Closed – An Hour and Forty-Two Minutes Ago! Eep! Forgot to pre-post my “It’s noon, entries are now closed” item. So, it’s now past noon, entries are definitely closed, and I’ll soon be posting the winner. Stay tuned! Comments Off on Entries Closed – An Hour and Forty-Two Minutes Ago! Freebie Friday has been running for a couple of months now, and seems to be growing in popularity. Don’t you think, though, that it’s about time there was a knitting-related prize? Other than a review copy of a book, that is? How about a felted entrelac bag? How about the first one I ever made? Disclaimer: Because of the weight of this week’s prize, I’m sorry to say I must limit entries to mailing addresses in the United States and Canada only. Knit from a pattern in Bags: A Knitter’s Dozen – a pattern I’m now knitting for the seventh time – this brightly colored bag was my first entrelac work. The yarn was Plymouth Galway, in five different colors. This was also my first felting (fulling) experience. And I’m pleased to say it went well. The bag felted up nice and thick, so thick it will stand on its own as sort of a floppy bucket. Sitting like this, the bag stands about eight and a half inches tall, and measures around twelve inches in diameter. Plenty of room for carrying a knitting project, cell phone, accessories. Why would I give it up? I did use this as my primary knitting bag for a while. Until I knit Entrelac bag #2 from Noro Kureyon, and made it even larger. The Noro Kureyon bag is now my go-to project bag, and My First Entrelac Bag sits idle. Much better to see her go to a home where she’ll be used! Would you like to provide that home? Will you love her and carry her and pet her as she deserves? It could happen – here’s how! It’s that easy! Will My First Entrelac Bag become yours? Enter now, and check back Monday to find out! Meanwhile, I’ll be busy knitting on Entrelac Bag #7 this weekend – I hope you have a good time, too! Autumn Color, originally uploaded by Folkcat. Not a lot of time for blogging today. I did have time to take this photo while Gryphon and I were out doing errands. I hear that overall our fall color hasn’t been the best this year, but as you can see, at least some trees are in good form. I’m less than happy with this flickr2blog option over at flickr. That’s the set-up that lets you take a picture with your mobile phone, then message it to flickr, and flickr posts it to your blog for you. It’s working about half the time. The rest of the time, I wind up re-sending and re-sending the photo, and maybe, eventually, it shows up at flickr. It can’t post to the blog if it doesn’t make it at least that far. 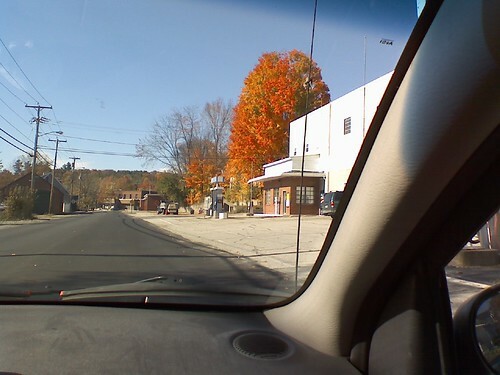 If it had worked today, for instance, any of the four times I’ve sent the same message to flickr2blog, you’d be looking at a photo of a brilliantly colored tree along Main St. here in Wilton. I was sending it via flickr2blog because I really don’t have enough time today to be in here posting right now. We had some excitement with Lola over the weekend. To help the Rattie Sisters get the attention they need, when Gryphon is home on the weekends he tries to spend some one-on-one Daddy time with them. Usually he does this by bringing one of the cages in on the bed with him while he relaxes and reads or watches TV. This Sunday, he had brought Lola in for a session. Meanwhile, I was at my computer in the living room, logged into Second Life, doing a little shopping for cool clothes. Suddenly, Gryphon was standing at my shoulder, announcing that he’d fallen asleep with Lola’s cage open, and didn’t know where she was now. Holy crap. Lola isn’t like Sable, who could “free range” safely because she didn’t really, well, free range. Sable always stays carefully within a perimeter that doesn’t take her too far from home. If this had been Sable out while Gryphon fell asleep, he’d likely have woken up to find her curled up on his chest. But no, it was Lola, and Lola knows no boundaries, nor any fear. Gryphon wasn’t sure how long he’d been asleep, either, so who knew where she’d gotten to? I logged out of Second Life, and we began the search. Our apartment is tiny, but stuffed to the gills with boxes and stacks of our belongings and craft supplies. She could be anywhere. We wandered all over, calling her name, shaking a bag of treats, listening carefully. I suddenly had a flash memory. Earlier that afternoon, as I sat at the computer, I’d felt something brush my right foot. I looked down right away, but saw nothing, and dismissed it as probably my pants hem moving as I shifted my leg. But what if it had been Lola? We looked all around under my desk, but couldn’t find any evidence that she was there. Gryphon was heartsick, I was panicked. Surely we’d have heard something if she was all right? We finally decided we had to stop actively looking, and tried to just relax, hoping that as things quieted down she’d come out on her own. We put her cage, open, on the living room floor, with a couple of treats next to it on the carpet. We sat talking in the living room, trying to think about things like what to do for dinner. Eventually, we heard a noise in the corner of the room. Behind my desk. The very desk I’d been sitting at when something brushed my foot. I sat on the floor in front of my desk, and stared into the corner. A cable moved. Aha! The left end of my desk has a built-in bookcase, but we don’t use it, because the only place to put the desk was in a corner. Lola was tucked away in that bookcase, which probably felt like a spacious, empty Rattie condo. And she was nibbling at a network cable. We pulled away a piece of furniture that would let us get back there. I crawled under the desk, and offered a treat. Lola came out the back, and I grabbed her and stuffed her in her cage. So, Lola got a major taste of freedom, we had a good scare, and all’s now well with the Rattie world. Oh, yes – even with Sable. She’s been feeling more outgoing and energetic lately, and while she still demands time curled up on my hand, it’s not as persistent and longlasting. She’s also eating on her own more readily, and not so much needing me to offer her the food from my fingers. In spite of all the Rattie drama, I’ve actually managed to squeeze in some knitting time on the Rusty Entrelac Bag. I reached a point yesterday where I ran out of the lighter red yarn, and had to stop. Today, Gryphon and I went to the LYS and picked up what should be all the yarn I need to complete the bag. That’s a skein of the lighter red (already rolled and being worked with), one of the darker (because I know what I have left won’t be enough), and one of Manos del Uruguay in black, for the base of the bag. The black will represent the unrusted iron, and will also make the colors in the rest of the bag thoroughly pop, don’t you think? I should be able to continue work on the Rusty Entrelac Bag now until it’s all knit, including the i-cord handles. Then, I just have to get around to felting three bags in the washing machine. Or figure out the next whatever to knit for Christmas! *Special note about Rattie chewing safety: Rats actually have a mechanism in their throats that prevents them from swallowing non-edible items that they chew. Otherwise, they’d have a real problem chewing through thick wooden beams as they’re sometimes known to do! Lola came to no harm from her chewing – the only casualty was the network cable. And even then, only that section she chewed on – Gryphon owns the parts and tools for cutting out the bad piece and putting new ends on. It’s also no particular surprise that Lola chose a network cable to chew on – studies have shown that computer network cables emit frequencies that rats find particularly attractive. This has been a real problem even in some very modern buildings when rats have happened to get under the floors in the IT centers. Rainbow, originally uploaded by Folkcat. 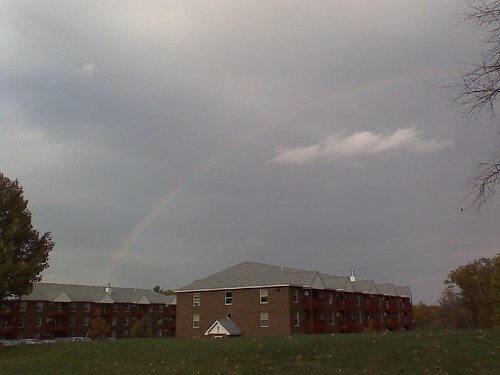 Rainbow sighted while picking up a friend. Hope this comes through better than the last one. Rusty Internets, Rusty Bag, originally uploaded by Folkcat. Our internets seem to be down for now. Good thing I can post a picture with my phone! 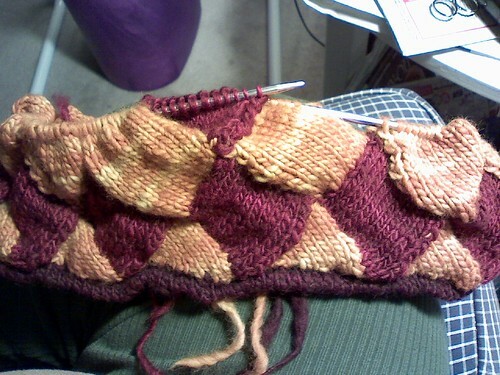 This is a look at the progress on my Rusty Entrelac bag. I’ve just started the fourth tier of squares. After this tier in the red, I will start shifting towards darker colors for the lower part of the bag. ETA: Our internet connection is back up. But for some reason, by the time it was, flickr still hadn’t passed the above post on from my mobile phone as it should have. Feh. What good is the flickr2blog option if it doesn’t actually go “2” the blog?